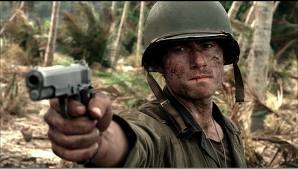 This weekend my husband and I binge watched the HBO mini-series The Pacific. Yup, we polished that off in the course of two days, not too shabby. I know what you must be thinking, this girl has no life, but really I was so busy and exhausted from my other life chores like helping my sister with college essays that sitting down and watching TV for hours was a much needed respite. We had spent 5 hours at Starbucks on Saturday writing essays about Obamacare, I was looking for anything to make me feel better. Last Christmas we stayed in and watched all of Band of Brothers. It was awesome, great and I learned a lot from watching it. Now how many shows can you say that about? 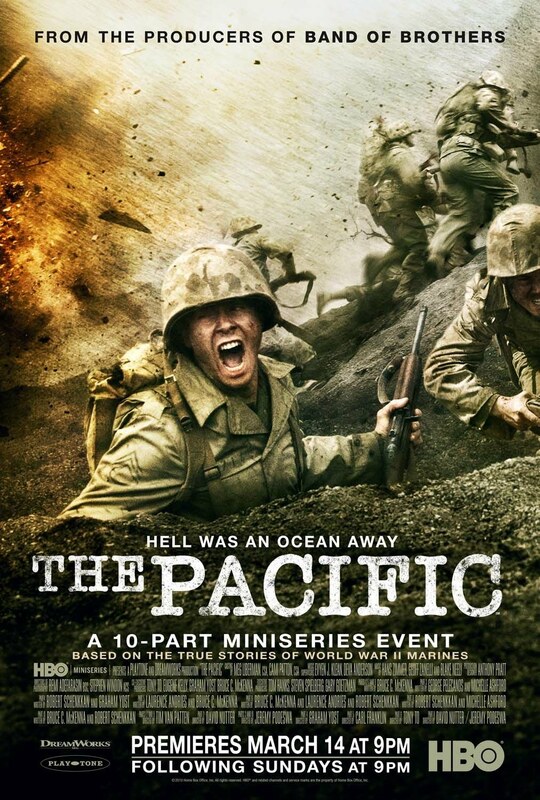 The Pacific gives us a continuation of the story of soldiers at war, this time braving the islands of the Pacific. I was excited to watch it, even though I knew it would be sad and depressing and stressful to watch. I don’t think this one is as good as Band of Brothers, it gets too wrapped in on the history aspect and trying to depict every single battle, instead of delving deeper into the characters and their lives. There were other characters on screen that I would have to learned more about, but those got side tracked with the battles on screen. Of course those are necessary for this show, but I think they could have given us more of a glimpse into their personal lives back home and who they were before they went to war. The writing of Band of Brothers is impeccable and gives the viewer a glimpse of history and each soldier’s viewpoint on the war. The Pacific instead, just gives us the stories of a handful of soldiers and we get to see how the war touches their life from inception to when the war is over. The mini-series is also based on real life people, so the stories hit even harder. 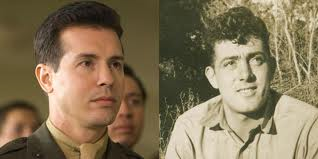 The show really centers on primarily a few characters, Bob Leckie (James Badge Dale), Eugene Sledge (Joe Mazzello) and John Basilone (Jon Seda). Leckie is a writer who fights through the epic battle of Guadalcanal and the jungles of Peleliu. We see him not only fight on screen, but he writes to a woman he pines for, detailing the harshness he faces in battle. Leckie is a dreamer, a romantic, the writer of the bunch. It’s as if he carries the weight on his soldiers, when is at the typewriter. He looks at the world with philosophical eyes, always brooding over what he has seen. Sledge or “Sledgehammer” as he is called is young and naïve, but wants to fight desperately for his country. Sledge is played by Joe Mazzello, of Jurassic Park fame; yes he’s that little boy from the movie. I was obsessed as a kid with most of his movies; Radio Flyer and JP, to name a few, so it was really cool to see him work as an adult. Sledge faces and sees horrible acts of war, yet through his eyes we see a softness of sorts to his character. Although some of his fellow soldiers have lost their humanity, we see that he has not lost his, but his soul has been tainted by the brutalities he has seen at war. Sgt. 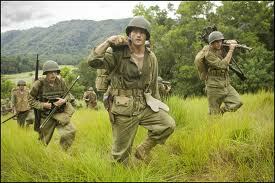 John Basilone is the hero of the bunch, we see him go from soldier on the ground to war hero to a married man. He is one tough son of a b and has seen some horrible things happen to his friends. 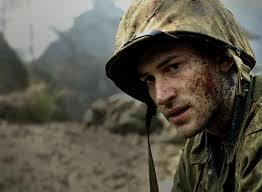 From Basilone, we see how he is used in a different side of the war. He is sent back as the image of heroism and as the face of the war bond effort. Almost a Brody from Homeland type of guy. I have driven past the world near Camp Pendleton that is named after him and it was interesting to see how he ended up there and how he trained new recruits. He left an impression on everyone and I really enjoyed seeing that side of the story. I would recommend this to anyone who is a history buff or war movie junkie like me. Although it is not the most fun, cheery thing to watch it is definitely worthy of a binge watching marathon.